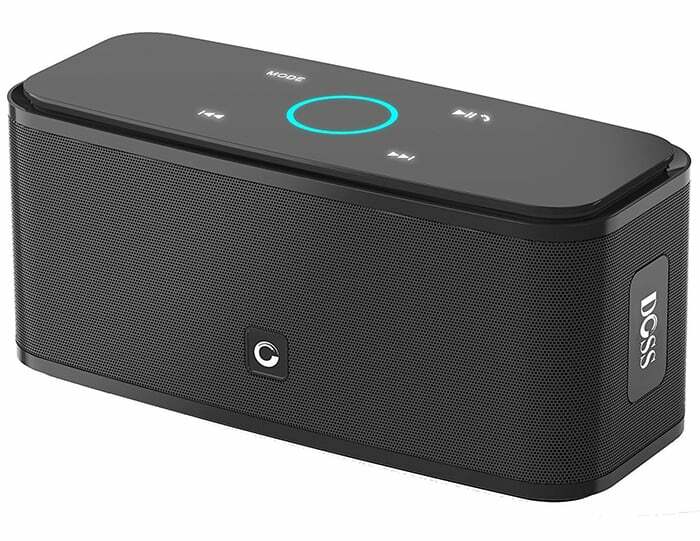 Over the past few years, advancements in Bluetooth technology (Bluetooth Low Energy) has made it possible to create consumer-friendly wireless speaker systems capable of producing high-quality audio. Wireless pairing now enables you to carry your speakers on-the-go, without the need for any additional wire or cord. Maybe you just want a portable speaker that you can carry in your pocket. Or maybe, a stereo system that you not only can keep at home, but also carry around, with the ability to immerse the entire room with rich sounds. Maybe you’re planning an outdoor trip, and want to carry speakers that can deliver a decent outdoor performance. Currently, there is a wide range of portable Bluetooth speakers available, for a variety of use cases. In this article, we’ll look into the top portable speakers you can buy, based on their size and form factor. Do note that we’ll not be primarily focussing on the “smart” speaker category, such as the Apple HomePod or the Google Home Max. However, some of the portable speakers mentioned here might support basic integration with Siri, Google Assistant or Amazon Alexa via voice prompts. You’ll find the products categorized into three different sections. The first one covers the portable speakers that easily fit into your pockets or handbags, and are ideal for personal use. Being pocketable in size, these speakers usually aren’t that punchy on the low frequencies, but provide a decent boost over smartphone speakers, and sometimes even good enough to fill a small room. The second category deals with medium sized speakers that are ideal for small and medium-sized rooms, and provide a decent experience indoors. Some of these might also be suitable for limited outdoor experiences, such as open-roof parties. 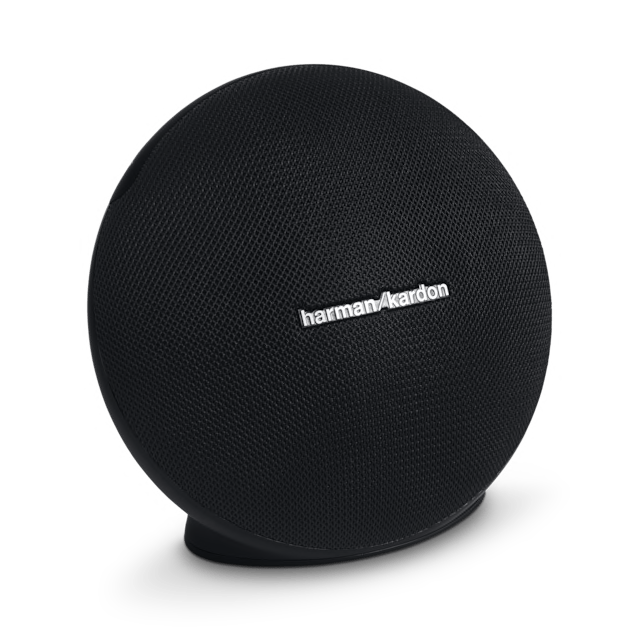 The third covers the bigger audio systems which are capable of producing loud immersive experiences, suitable for both indoors as well as outdoors (including large, open spaces), yet portable enough to carry them around easily. The following are some of the best pocket-sized Bluetooth speakers that provide a decent performance for personal use. For a speaker so tiny, the SRS-X11 produces decent sound output, which is great for personal use. Although you might not get a satisfactory bass response from these speakers, they do quite well with the mids and the highs. The SRS-X11 has one driver and a passive radiator; it supports USB charging and can pair up with devices via Bluetooth or NFC. The speaker also has a speakerphone to receive calls from your paired smartphone, but call quality is poor at best. Voices sound unclear and muffled; the built-in microphone also isn’t good enough. The build quality of the speaker is quite decent. It has a rubberized top with four buttons for power, speakerphone and volume controls, as well as the NFC chip. This speaker holds a decent battery which lasts up to 10 – 12 hours on a single charge. In solo mode, it provides mono audio output. But, it can be paired up with a second SRS-X11 (by holding the power button on both the speakers) for multi-room or stereo mode, and the channel separation works quite well with the speakers being within 5 meters apart. And even though they’re not that powerful, the speakers don’t distort too much, even at higher volumes. 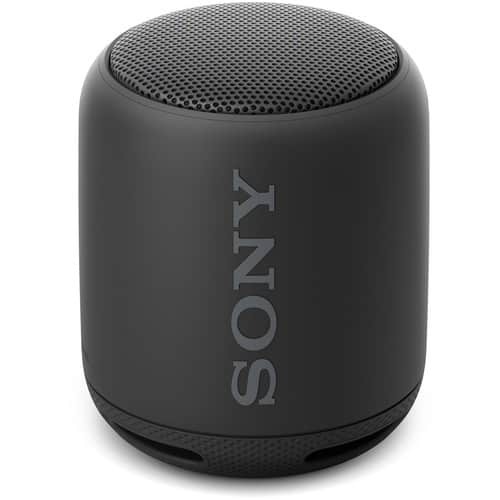 At around $60 a piece, this little Sony speaker exceeds the expectations you’d normally have from a speaker this size. These are perfect for some light music listening sessions that you can enjoy at the comfort of your room. The speakers aren’t water resistant, but considering the price, you’re already getting more than you asked for. 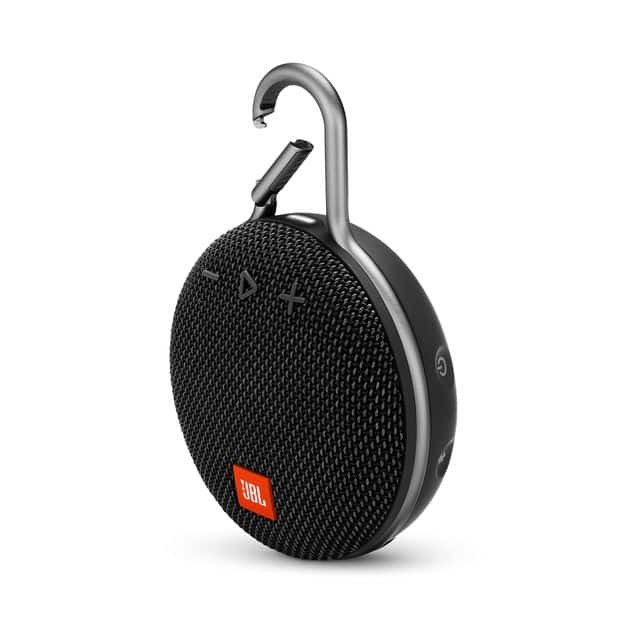 If you’re planning on getting an ultra-portable speaker that you can latch on to different objects on-the-go, you might want to consider the JBL Clip 3. It’s a circular speaker that easily fits in your fist, and has a durable clip on the top that you can use to latch on to objects. In the front, you get the JBL-style standard mesh speaker grill, along with the volume controls and the play button. Along the side, you get the power button and the Bluetooth pairing button. At the bottom, you get the standard micro-USB port for charging and an auxiliary port for non-Bluetooth connections, protected under a rubberized covering. For a speaker this size, the JBL Clip 3 does get loud. The unit has a single driver and a passive radiator, both facing the speaker grill, so the sounds are primarily directional in this case. The speaker is waterproof and floats in water. Unfortunately, the Clip 3 isn’t one of the JBL speakers that support the Connect or Connect+ feature, so you cannot play to multiple Clip 3 speakers simultaneously. The speaker is meant primarily as a companion in your travels, with which you can enjoy some light music. And with around 10 hours of battery life (at 50 percent volume) on a single charge, this little speaker packs enough power to last you throughout the day. If you’re looking for more bass from a small speaker, the SRS-XB10 offers it at a slightly higher price. The XB10 is the smallest and the cheapest of Sony’s Extra Bass (XB) lineup and provides pretty impressive sound relative to its size. The XB10 measures about 3.5 inches tall and weighs about 260 grams. A single driver faces up for 360 degrees sound, while the passive radiator faces down. The sides and the bottom of the speaker have a rubberized finish. The overall build quality of the speaker is decent, though it lacks the premium feel. Along the side, you’ll find the regular play/pause, power and volume control buttons, along with an Add button to pair a second XB10 for multi/stereo output. It supports USB charging via a micro-USB port and has an auxiliary port for non-Bluetooth devices. Like other speakers in the Sony lineup, this one supports NFC pairing too. The sound quality of this speaker is pretty impressive. The bass output is quite punchy and can go down to 40 Hz, although it gets a bit distorted at higher volumes. The speaker sounds best at about 75 – 80 percent volume. Battery life is documented as 16 hours, but in reality, it provides around 12 hours of backup at 75 percent volume. The unit isn’t shockproof, but it can resist splashes of water. However, it might not survive if fully submerged under water. The UE Roll 2 is almost identical to its previous generation UE Roll and follows the similar round shape. In the front, you get UE’s signature volume rockers over a standard mesh speaker grill. At 350 grams, the Roll 2 is light enough to be carried around and includes a bungee strap at the back that allows you to attach it to a wide range of objects. At the back, you also find the power button and the Bluetooth pairing button, and at the bottom, you find the Micro-USB charging port and the auxiliary port protected under a rubberized covering. Battery life on this unit is quite good, at around 9 hours on a full charge, but it does take around 5 hours to recharge the battery from a dead state. Sound quality is decent, with not much amount of bass; although the mids and highs sound quite clear on this unit, even at a 100 percent volume. The Roll 2 has an IPX7 rating, making it waterproof. However, it does submerge in water so it’s not quite convenient to place it in a pool. Although, the unit does include a Floatee to prevent the Roll 2 from sinking. And although this does not have any rating for dust resistance, its rugged surface can withstand a fair amount of dirt. Overall, the UE Roll 2 is a great ultra-portable speaker for personal use; one that you can easily keep at your desk, attach it to your shower or take out to the pool. 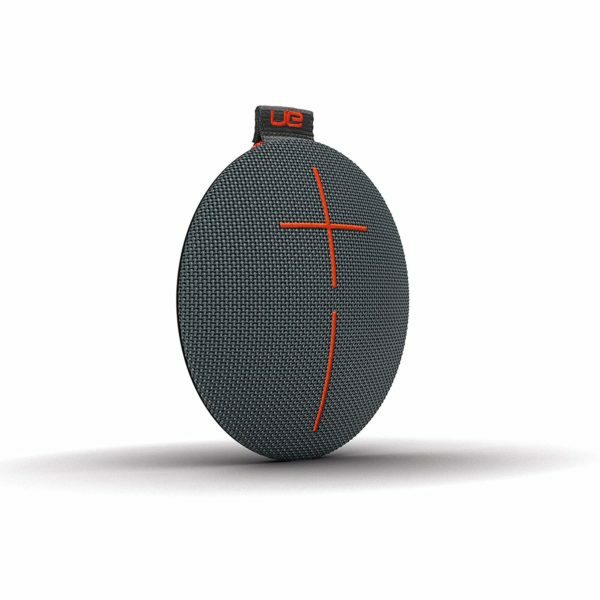 The UE Wonderboom is a rugged speaker capable of producing sounds in 360 degrees. With an IP67 rating, the speaker is dust tight and waterproof, as well as drop resistant. The speaker also can float in water on its own, making it a great candidate for outdoor listening. On the top, you get the power and Bluetooth pairing buttons, as well as the UE logo which doubles as a playback control button — a single tap to play/pause and a double tap to skip to the next track. On the side, a soft rugged mesh wraps around the speaker, and also include UE’s signature volume control buttons. On the rear, the unit only has a micro-USB port for charging, but there’s no auxiliary port for non-Bluetooth connections, which might be a turn-off for certain users. UE claims about 10 hours of battery life on the speaker, and at 50% volume, it does live up to the expectations. Although, at higher volumes, it does use up a lot more power, and at maximum volume, the speaker lasts a little less than 3 hours on a full charge. The sound quality on these speakers is quite good, and it brings in the bass which is missing on the UE Roll 2. It is pretty loud compared to its compact size and is great for small rooms. It works fine as a casual speaker that you can also take out on your camping trips. The speaker performance was decent throughout different genres of music, although at higher volumes, the lows and the highs may get distorted sometimes. The tagline of this speaker, “Tiny until you turn it on” speaks volumes (literally). This little guy is one of the best Bluetooth speakers available in the market, in the small speaker category. The matte finish on this unit is of premium quality. It’s also waterproof, so you can take it with you anywhere without the risk of getting wet. It does submerge under water though, so you might want to be careful around deep water bodies. The SoundLink Micro has a single 40 mm driver and a passive radiator that produces impressively deep bass for its size. It also supports stereo pairing with a second speaker for channel separation and soundstage. On the top, it has the power and Bluetooth pairing buttons, along with the micro-USB port for charging. On the front face, there are the volume controls and the speakerphone buttons above the speaker grill. At the back, you get a rubber strap, which helps you attach the unit to a range of objects. At $100, the SoundLink Micro is one of the most premium-built, waterproof, ultraportable speakers that produces deep bass and clear vocals without distortion. Battery life is about 6 hours, which is not that great, compared to other speakers in this range. But, if you’re looking for high-quality sound at an ultra-portable form factor, the Bose SoundLink Micro might be the one for you. 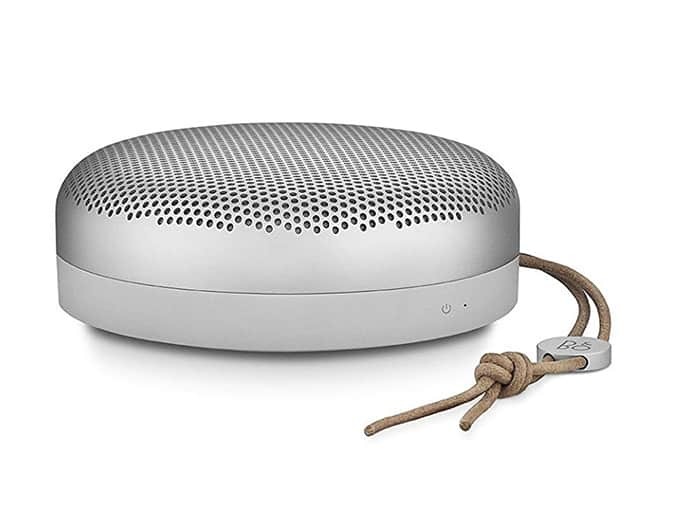 The Beoplay A1 is one of the most premium looking portable Bluetooth speakers in the small speaker category. At $299, it is a bit costlier compared to the other speakers in this category, but it’s also one of the sounding speakers in this category. The Beoplay A1 is capable of producing loud, high-quality music, enough to be audible even around a medium-sized room. The unit is dust and water resistant and can withstand jets and splashes of water, although it is not fully waterproof. On the unit, you can find a series of buttons, starting with power and volume controls. Moving further along the side, there is an auxiliary port for non-Bluetooth connections and a USB Type-C port for charging. There are also two additional buttons, which allow you to pair it with the last known device and pair up with a device for the first time, respectively. Lastly. you get a speakerphone button for calls and smart assistants. The speakerphone on the Beoplay A1 is one of the best speakerphones you’ll get on a Bluetooth speaker. The voices are clear and it doesn’t echo or sound muffled at the other end. Paired up with a second A1, the setup is really impressive and fills up a large room with stereo sound without any detectable distortion. Battery life is advertised at 24 hours, but at 50 percent volume, the speaker is only able to last up to 9 hours. If you’re looking for a premium looking high-quality speaker, which is also small in size, the Beoplay A1 is one of your best choices if you don’t mind the higher price tag. If you’re looking for a decent Bluetooth speaker in the budget range, it can’t get better than the $30 Doss Touch, aka the Doss Soundbox. 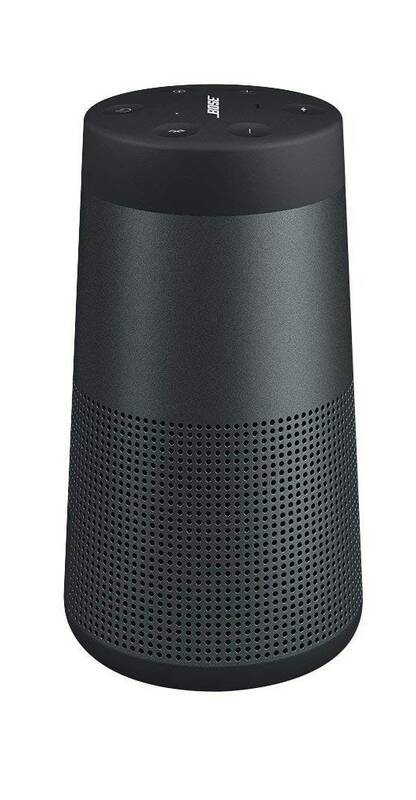 At $30, you get a full stereo dual driver unit covered in an aluminum grill, while having a slightly matte finish at the top with the usual touch-sensitive play/pause, previous/next, speakerphone buttons, and a volume dialer. At the back, it has a power button, an auxiliary port, a microSD card slot, and a micro-USB port for charging. The sound performance on this speaker is pretty decent. Although the bass response is not much deep (which is expected from a speaker so cheap), the lows, mids, and highs all sound quite clear without much distortion. Battery life is advertised as 12 hours, but you could get up to 14 hours while listening at 50 percent volume. All this is quite impressive, especially given its price tag. The unit does not come with any certified dust and waterproof resistance, however, and you might want to be a little bit careful about using it outdoors. Overall, the Doss Soundbox is a great bang for the buck when it comes to portable Bluetooth speakers. The speakers in this category aren’t small enough to fit in your hands, yet they are lightweight and portable enough to be easy to carry around in your backpack. 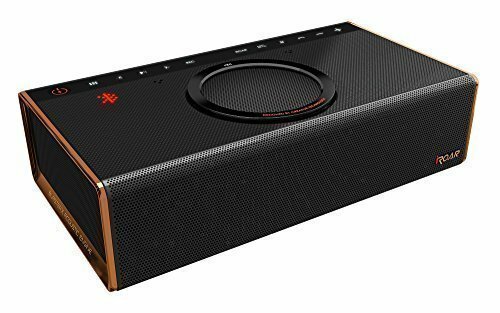 These usually occupy the midrange sector of portable Bluetooth speakers, as far as cost goes, and provide a decent indoor experience. Additionally, they might also be suitable for limited open-air experiences, such as, around a swimming pool, or an open-roof party. The Sony SRS-X55 packs a punch for its size. The speaker produces 30W output with an S-Master digital amplifier, Sony’s proprietary Digital Sound Enhancement Engine (DSEE) and 2.1 channel audio drivers, along with two passive radiators at the back. At 1.2 kilograms, the unit isn’t quite lightweight, but then again, the rectangular SRS-X55 is primarily meant for experiencing audio indoors. It doesn’t have any IP rating, which would further explain its position as a home entertainment speaker. The battery lasts around 10 hours on a single charge played at 50 percent volume. The unit includes a proprietary charging cable, as well as an analog input port. The speaker uses Sony’s proprietary ClearAudio+ algorithm for optimizing sound output, which makes the mids and highs clearly stand out. At $180, the SRS-X55 offers good quality bass for its size, and you can easily place it in your living room and listen to it playing loud from another end of it. The Onyx Mini is almost as large as the UE Roll 2 but offers loud and clear sound for a speaker that small. It includes two 45 mm drivers covered by a tough mesh speaker grill. At the back, the unit houses a passive bass radiator that vibrates to produce deeper bass. The bottom has a flat base to help the speaker stand upright at an optimum angle so that you can keep it on a desk with the unit facing you. The speaker can get quite loud without much distortion, except at peak volumes. The battery lasts up to 10 hours on a single charge, playing at 50 percent volume. Apart from that, it includes the usual array of buttons — power, speakerphone, play/pause and volume rockers. The speakerphone on this one is pretty decent, offering voice clarity while speaking close to the speaker, but it gets muffled and prone to echos as the distance increases. It does not have any dust or water resistance, so it’s primarily built for indoor use. You can pair up to two speakers simultaneously for a multi-speaker experience, however, it does not support left and right channel separation. The lack of these two features could be significant turn-offs, given that the competitors offer them in products that cost significantly lesser. Otherwise, the Onyx Mini is one of the better sounding speakers available in this form factor. It offers significantly deep bass, while also providing decent mids and highs. The UE Boom 2 is a cylindrical speaker that is about 7 inches tall, 2.75 inches in diameter and weighs just over 500 grams. Its outer mesh is rugged and feels quite premium. It’s waterproof and can be fully submerged in water. Even though it is lightweight, the Boom 2 doesn’t float (unlike it’s bigger sibling, the UE Megaboom). There is the power button, along with the Bluetooth pairing button at the top. Along the curved surface, you find UE’s signature volume control buttons. At the bottom, you get an auxiliary port and a micro-USB charging port, along with a removable hook that allows you to hook the unit to a range of objects. Battery life on this speaker is claimed to be 15 hours, although, in reality, it only lasts a little more than 10 hours played at 50 percent volume. By itself, the Boom 2 offers a loud 360 degree sound, which can easily fill a small to medium-sized room. But you can also pair it up with a second Boom 2 or Megaboom speaker for a multi-speaker or stereo experience. The sound quality of this speaker is pretty decent. Its omnidirectional design provides true 360 degree sound in all directions with the same loudness. At maximum volumes, a single unit can even fill up large rooms, although, at maximum volume, it does sound a little distorted for the low and high frequencies. The mids are decent but are not as crisp and clear as some of the other competitors. But, if you’re looking for a loudspeaker to fill the room or a rugged one for outdoor trips, this cylindrical speaker may be what you’re looking for. Also see: If you’re looking for a slightly bigger and louder speaker for larger rooms, the UE Megaboom might be a good option too. Update: Recently, UE also introduced the Boom 3 and Megaboom 3, which feature some major improvements over the Boom 2 and Megaboom. JBL Charge 3 is arguably one of the best midrange portable Bluetooth speakers in the market. It has pretty deep bass, as well as decent mids and highs. It has a cylindrical body covered by a rugged mesh fabric, covering the two 50 mm transducers inside. It also has two passive radiators on either side, which vibrate to reproduce low frequencies. Underneath, the speaker also houses a 6000 mAh battery that is advertised to last around 20 hours. The Charge 3 is waterproof, and unlike many other competitors in the market, the Charge 3 does float in water. 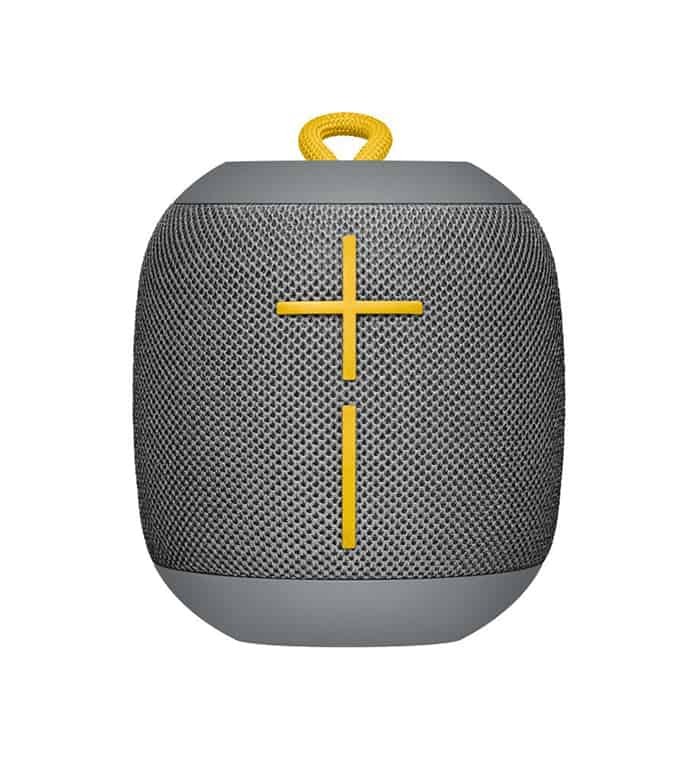 The Charge 3 is compatible with JBL Connect; that means, you can connect with other Connect compatible JBL speakers and enjoy music in Party mode (with every speaker playing the same thing), or set up a soundstage with left and right audio separation. On the mesh, you get the Bluetooth pairing button, the volume controls, play/pause, power button, and the Connect button. At the back, along the mesh, a rubberized covering houses an auxiliary port, a micro-USB port for charging and a USB-A port to use the unit as a power bank for other devices. The Charge 3 gets pretty loud and covers the entirety of a small to medium-sized room. The bass is significantly impactful and goes deeper than many other midrange speakers, and it does not distort at higher volumes. However, the bass may sometimes also dominate over the vocals and mids, reducing their clarity. 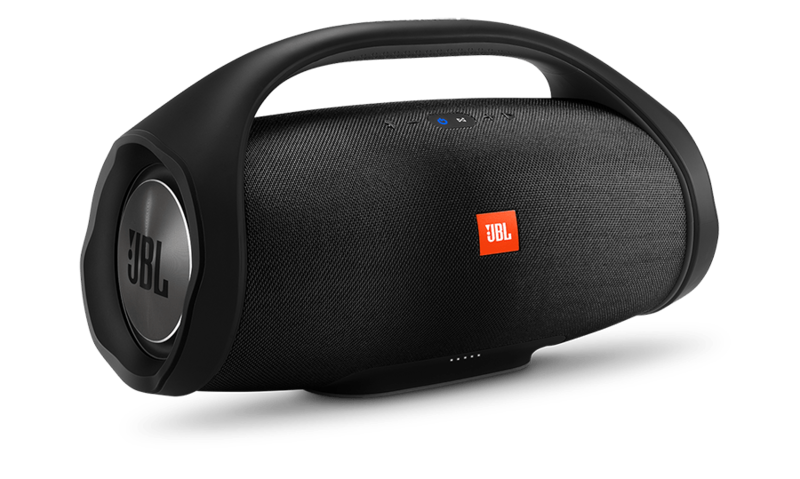 Also see: If you’re looking for a smaller speaker with more clarity on the mids, you might want to consider the JBL Flip 4. Alternatively, if you’re looking for a party speaker, you could also go for the Sony SRS-XB41. 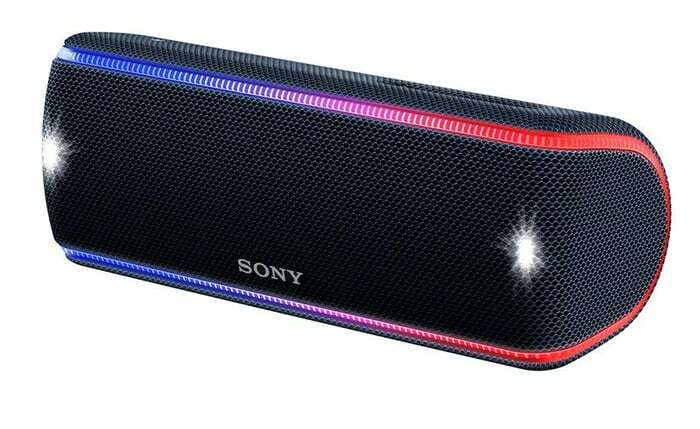 The SRS-XB31 is one of the punchy louder speakers among Sony’s XB lineup and has quite a few tricks up its sleeve that’s missing in some of the other Bluetooth speakers available in the market. The unit is a rugged rectangular block with a mesh speaker grill all around and has an IP67 rating dust-tight, waterproof body. Sony advertises this one as a party speaker; it has a punchy bass that does not distort much at high volumes. Additionally, it also features a Live sound mode, which makes you feel as if you’re listening to a live performance. That’s not all, the XB31 also features an LED line light around the front face of the speaker, as well as flashing strobes along the sides, that light up rhythmically with the music being played. Battery life on this speaker is advertised up to a whopping 24 hours (in standard mode with lighting off). At the back, you can find an auxiliary port for direct connections, a micro-USB port for charging the unit, as well as a USB-A port for charging other devices using the XB31. It also features Sony’s trademark NFC technology for quick and painless pairing. And the fun doesn’t just end there. You can mix and match between different LED light colors. And there’s a Party Booster feature, with which you can tap the speaker in different places to make different sounds, like a scratch, snare, kick drum or cowbell. A light tap will emit a soft sound, while a forced hit will create a louder output. 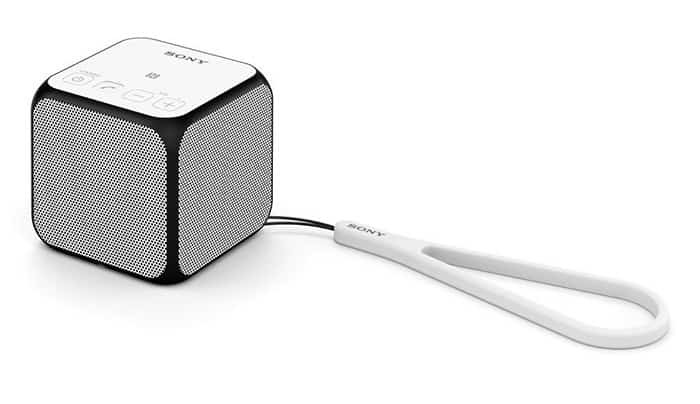 Of course, you can pair up to a 100 compatible Sony speakers in party mode, or use two units for stereo output. 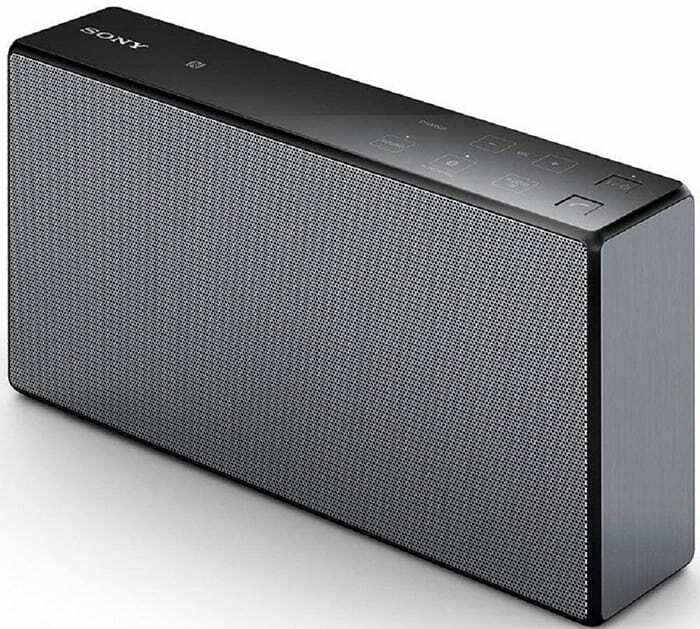 The Sony SRS-XB31 is a loud outdoor speaker that is easy to hold and carry around. Also see: If you prefer better mids over punchier bass, you might want to also look at the Sony SRS-XB30. 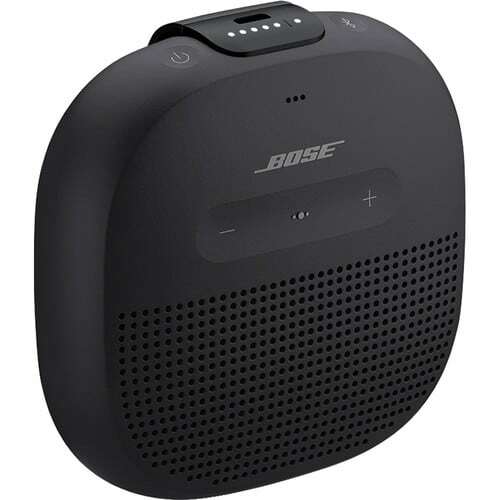 You might also want to check out the Bose SoundLink Mini 2. The iRoar Go from Creative Labs is a lightweight, medium-sized Bluetooth speaker with 5 drivers, which includes a built-in subwoofer and two passive radiators at the sides. Its body is covered in a premium metallic grill at the front and back, that can resist splashes of water. Just above the speakers, there is an array of buttons for power, volume control, Bluetooth pairing/speakerphone, and a button to select the Source. That’s because the iRoar Go can also play MP3/FLAC files from a microSD card. Additionally, the speaker also supports NFC technology to wirelessly pair up with compatible devices. At the top, there is the charging port, an aux-in port for non-Bluetooth connections, a USB-A port for charging other devices, a micro-USB that allows it to function as a Sound Blaster sound card for laptops and desktop computers, and a microSD card slot, all covered under a rubberized flap. It should be mentioned that the micro-USB port cannot be used to charge the iRoar Go. You need to use the dedicated charging port in order to do so. Under the hood, this unit packs a 5200 mAh battery that lasts up to 12 hours on a single charge. You also find the regular media controls at the top. The sound quality on this thing is pretty impressive. The unit features Creative’s signature SuperWide technology that delivers a wide soundstage with distinct left and right separation. For a medium-sized speaker, it gets pretty loud. At low to medium volumes, the speaker sounds clear, and with pretty deep bass, too. Occasionally though, especially with certain genres of music, the speaker sounds a bit muddled at the mid-tones, while the higher frequencies tend to be a bit noisy. Overall, the iRoar Go performs better than the JBL Charge 3 on most occasions, and given the multi-purpose nature of the speaker and the wide soundstage, the iRoar Go is a great buy at $150. 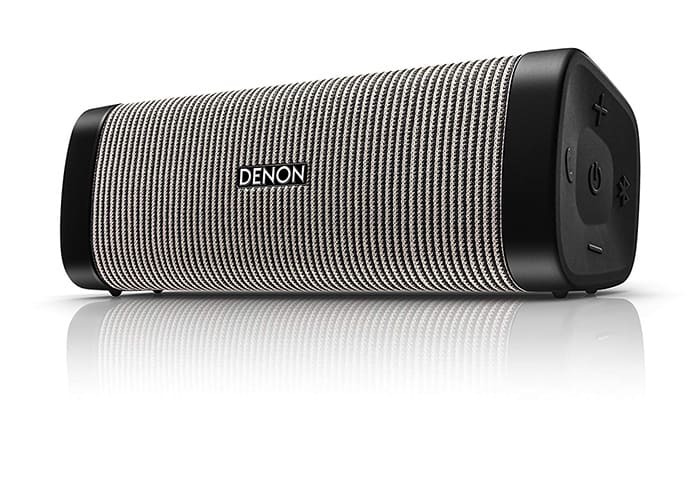 The Denon Envaya is a little beast in its own accord. 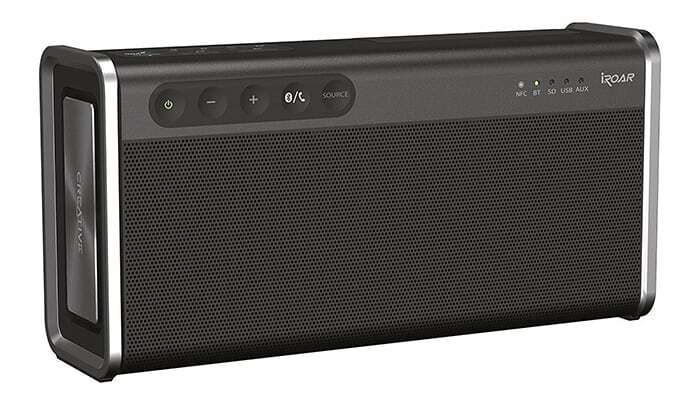 It is a rectangular speaker wrapped in a rugged nylon-like fabric around the front. Under the hood, it packs two 40 mm drivers, as well as a passive radiator for bass response. It also houses two high-efficiency 13.5 W digital amplifiers to ensure loudness that immerses even small to medium-sized rooms. It also supports Bluetooth aptX codec that allows CD-quality audio streaming over Bluetooth, as well as low latency between the connected device and the speaker. If you’re a fan of lossless audio, this is one of the features you’d want to consider. The speaker supports stereo pairing with another Denon Envaya, enhancing an immersive experience that is already loud and clear with a single speaker. The bass is deep, the mids are clear and the highs are pretty crisp. Even at higher volumes, the speaker maintains great composure, with minimal distortion at maximum volume. It also sounds good at low volumes and does not get too quiet, unlike many other speakers in this range. The unit has a battery life of 13 hours and can be charged via the micro-USB input port. At the side, there is the standard set of controls, including power, Bluetooth pairing, volume controls and speakerphone. At a $199 price tag, the Denon Envaya DSB-250BT is arguably among one of, if not the best Bluetooth speakers in this range. Also see: If you’re looking for a smaller speaker that sacrifices a bit on the bass in lieu of a bit more clarity, check out the Denon Envaya Mini. The Revolve is the smaller sibling of the Revolve+ model, which, apart from a few features, are identical in most aspects. The speaker has a tapering cylindrical shape, which suits its 360-degree speaker setup. Under the hood, it features an omnidirectional acoustic deflector, a downward facing full range transducer that works with the acoustic deflector, and dual passive radiators for bass response. The speaker also houses a battery that lasts up to 12 hours on a single charge. On the surface, it features a premium, seamless metallic finish, with a mesh all around. the unit is splash and shock resistant to prevent damage in case of accidental drops or water splashes. On the top of the Revolve, there is an array of buttons for power, Bluetooth pairing, volume controls, input selection, as well as a multi-function button that functions as a playback control button, a speakerphone, and a smart assistant trigger all at once. For a speakerphone, the Revolve does really well by transmitting the person’s voice clearly, even if they move a few feet away from the speaker. Using the input selection button, you can choose to play between aux-in or micro-USB, both of which are located on the back of the speaker. You can pair two Revolve or Revolve+ speakers for playing the same thing simultaneously in party mode, or as left and right audio channels in stereo mode. Overall, the speaker is significantly loud for its size and comfortably fills up small to medium-sized rooms. At medium volume, the lows do sound a little overwhelming on certain bass-heavy tracks, which affects the quality of vocals and other mid-tones. Otherwise, the speaker sounds great and mostly better than many other speakers comparable to its size. Here, we’ll list a series of Bluetooth speakers that are able to get really loud; so loud, in fact, that you can enjoy them not only in larger rooms but also (in most cases) outdoors in open spaces. And, of course, we have still considered the portability factor even though most of these speakers are comparatively large in size. The Woburn follows Marshall’s classic design elements — the gold-plated logo, the analog controls, and even the bunch of ports, that resemble a retro-style speaker. But, this thing is actually a full-range Bluetooth speaker. The size of this speaker is really huge. On the top, you get an array of ports and controls, including an auxiliary port for direct connections, an indicator for the current mode it is in, a set of analog knobs for volume, bass and treble controls, a button to toggle between the different input sources, a Bluetooth pairing button, and an analog switch to power the speaker on or off. At the back, it has a power saver switch, an AV input port, an optical input, and an AC power input. This unit doesn’t have a built-in battery, and you’ll have to plug it into an external source in order to power it up. It also doesn’t have an IP certification, so you’d want to be careful not to spill water or liquids on speaker’s body. 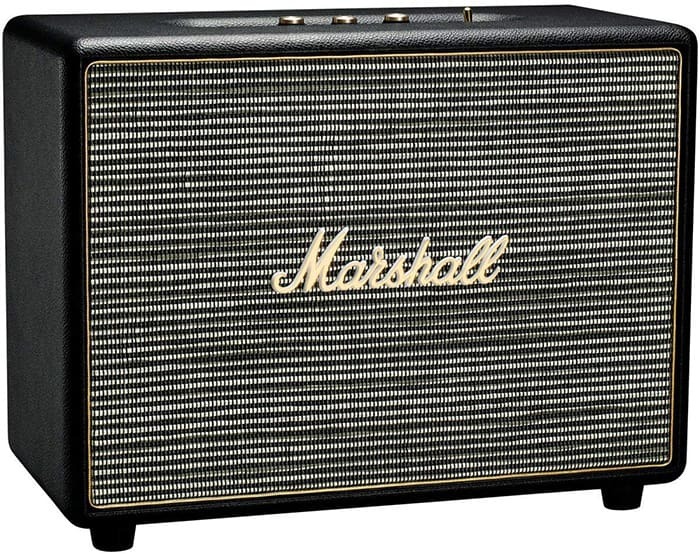 The sound quality on the Woburn is what you’d expect of a typical Marshall speaker. The bass is not as punchy as it should be, considering its size, but the mids and highs are clear when played at low and medium volumes. At maximum volume, though, the bass distorts and the highs get a bit noisy. This speaker is best suited to play the classic rock genre of music. If you’re into modern pop, hip-hop or EDM music, this speaker might not appeal to you. The design of Onyx Studio 4 resembles that of its smaller sibling, the Onyx Mini. It is a circular speaker housing two 75 mm woofers and two 20 mm tweeters, as well as a passive radiator at the back. Along the curved edge at the top, you get the Bluetooth pairing button, the Connect+ button for multi-speaker pairing, the volume control buttons, a speakerphone button, and the power button. At the back, there is a micro-USB port for external connections, an auxiliary port, and a power supply port. The unit does not charge via the micro-USB input. A fully charged battery is claimed to last up to 8 hours. At a little over 2 kgs, this speaker is a pretty heavy one. It does have a rubberized handle to let you carry it from one place to the other. However, that being said, this speaker is primarily meant for indoor usage in larger rooms. There’s no dust, water or drop resistance featured here, and the speaker also accompanies two removable stands that allow it to rest in an upright position. The speaker also supports pairing up with other Connect+ compatible speakers either in stereo or party mode. The bass response on this speaker is great. It produces deeper, punchier bass than many of its other competitors and it does not meddle with the mids. That being said, some of the other competitors have better, brighter vocal and mid-tone response compared to the Onyx Studio 4. So, if you prefer deep, punchy bass over mid tones, this speaker is definitely for you. Alternatively, if you prefer more clarity on vocals and instruments, you might want to check out some of the other options. Overall, the Onyx Studio 4 is a great speaker that does well in nearly all the departments. The SoundLink Revolve+ is larger, heavier, generates higher volume, and achieves more room-filling sound (hence, also suitable for larger rooms) than its sibling the SoundLink Revolve. The Revolve+ also includes a carrying handle for easier portability, given its larger diameter, and provides up to 16 hours of battery life. Comparatively, the smaller Revolve does not have a carrying handle, and its battery lasts up to 12 hours. Apart from these, all other features are identical. The Fugoo XL is one of the toughest portable Bluetooth speakers available in the market. The speaker comes in three different varieties, the basic Style model, the rugged Sport model, and the ultimate Tough model. The only difference between these models is the shell; the main speaker unit is the same in all the three variants. In fact, you can also purchase additional shells for the speaker, and can easily interchange between them. Removing the shell off the speaker is quite easy, and can be achieved by unscrewing a couple of large screws and sliding out the main unit. With an IP67 rating, the Fugoo XL is built to survive almost anything. It is drop resistant, as well as dust and waterproof. The built-in battery is also significantly large and lasts up to a whopping 35 hours on a single charge. Another feature worth mentioning here is that the Fugoo XL supports Bluetooth aptX codec. That means you can stream CD-quality audio over Bluetooth at no data loss. At the top of the speaker, you have several buttons for playback control (previous, play/pause, next), volume control, and speakerphone. On one side, you get the power button, an auxiliary port, and the Bluetooth pairing button. On the other side, a water-tight seal protects a micro-USB port (used for firmware updates), a charging port, and a USB A port to serve as an input for charging other devices. Under the hood, this thing packs 8 Fugoo-designed Core-X acoustic drivers — four neodymium tweeters, two neodymium aluminum-domed mid-woofers, and two passive radiators. 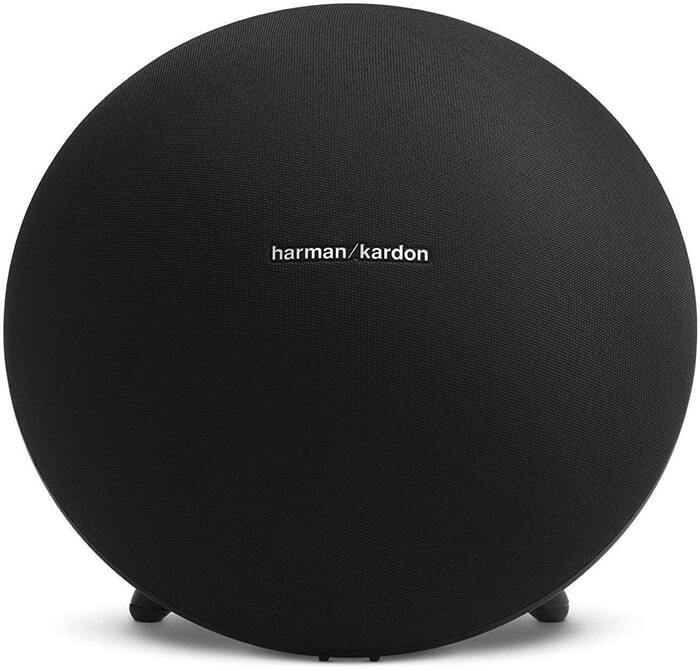 This is one of the very few speakers that deliver 360-degree full range omnidirectional sound. The speaker mostly performs well throughout different genres of music, The bass is punchy and deep, the mids are clear, and high notes aren’t noisy or shrill. As a standalone speaker, most users won’t find anything to complain about the Fugoo XL. When compared head to head with a select list of competitors though, it might just fall short on a few occasions. The mid-range iRoar Go also has an older, larger sibling called the iRoar, which comes with a slew of unique features that it can boast about. Touting itself as the most intelligent speaker on the planet, this speaker is powered by a proprietary digital audio processor SB-Axx1 that optimizes the audio output in real time to provide a better experience. Inside, there is a 5-driver setup, including a single upward-facing woofer, two front-facing tweeters and two passive radiators at both sides. Similar to the iRoar Go, the iRoar also uses a digital amplifier for the tweeters and a separate dedicated digital amplifier for the woofer. A single iRoar, by itself, provides an immersive, room-filling, wide stereo experience. However, you can also pair it up with another iRoar unit using the MegaStereo Cable (which is sold separately) in order to achieve an even wider soundstage. The unit has intelligent touch controls that are context-based depending on the mode you’re using the speaker in. It has a micro-USB port to connect to a computer and act as an external sound card, a microSD card slot for playing MP3/AAC/WAV files off it, an auxiliary port for direct non-Bluetooth connections, an optical audio input port, and a USB-A port to serve as a power bank for other devices. The iRoar houses a 9000 mAh battery that lasts up to 20 hours on a single charge. As for other accessories, the iRoar can be paired up with a Docking Subwoofer that delivers even louder and more powerful sounds. It also works with a special directional microphone, which you can use to set up a Public Address system. The mic also has built-in controls for your music, so you can wirelessly control playback on your iRoar with it. The iRoar Dashboard app for iOS and Android helps you to further customize and fine-tune your speaker. You can personalize the sound to control bass and treble, push vocals forward, control the 360-degree surround sound experience, and even tune it for better speech clarity in music, movies, TV shows or games. You can also set custom audio profiles, or use the available presets to suit your needs. Overall the Creative iRoar is a great portable speaker for large rooms, with clear sound performance throughout the spectrum. And, it can even get better with customization. 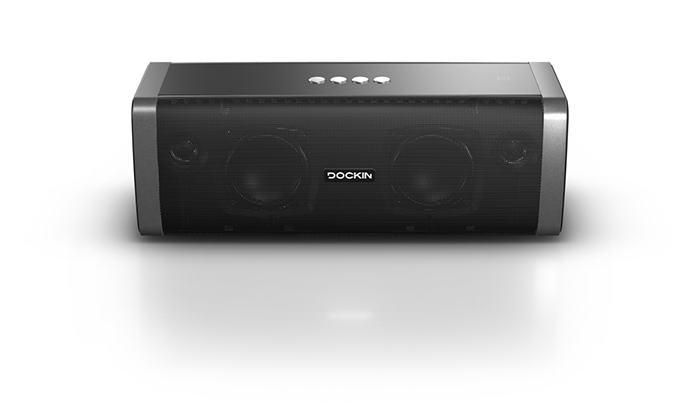 The Dockin D Fine is german product and often competes against the top-tier range of portable Bluetooth speakers. It has what Dockin calls a two-way stereo setup, with two woofers and two tweeters facing up front, and two passive radiators at the back. The unit is dust and water resistant and comes with a carrying pouch that offers further protection. The built-in battery lasts up to 10 hours on a single charge, and it also includes a USB-A port to charge other devices. The D Fine is built for indoors as well as outdoors and gets really loud. The bass is especially prominent, and sometimes even overwhelms the vocals and mid tones. The high notes might get a little noisy at higher volumes, but at lower volumes, they sound on point. Overall, if you’re looking for a full range speaker that’s built for both indoors as well as outdoors, at a competitive price, the Dockin D Fine is a fine choice. 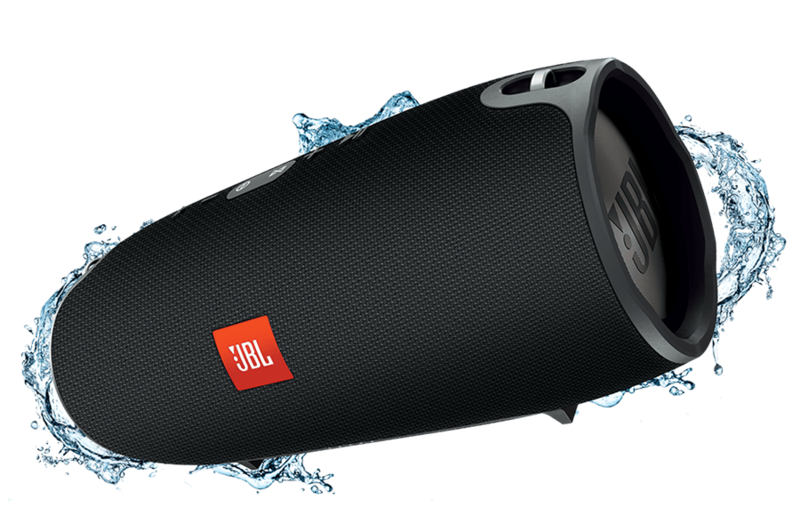 The JBL Xtreme is one of the best portable speakers in the market. Following the traditional JBL design, this speaker has a rugged fabric mesh all around. The body is also splash proof, allowing it to be used near the pool outdoors. Although the Xtreme isn’t fully waterproof, it floats in water, and as long as you don’t submerge it intentionally, the speaker should be okay. Along the fabric surface, the speaker has a series of buttons for Bluetooth pairing, volume control, playback control, the power button and the Connect button. The Connect feature can be used to pair the Xtreme up with other compatible speakers to either play from the same source or as separate left and right audio channels for a wider soundstage. At the back, there is an array of input ports behind a zipper, including a micro-USB port (for firmware updates), an auxiliary port for non-Bluetooth connections, two USB-A ports for charging other devices, and a dedicated power port for charging the unit. Inside, the unit holds a massive 10000 mAh battery that can last up to 18 hours on a single charge, played at 50 percent volume. The sound performance on this unit is one of the best. It houses two 63 mm drivers and two 35 mm tweeters faced front, while two passive radiators take up either side for a better bass response. The bass is loud and deep, the mids are upfront and the highs are clear, all throughout the volume range of the speaker, without any noticeable distortion. The only downside to this speaker may be the lack of a prominent soundstage, compared to other full range speakers in the market. Also see: JBL recently released an updated model for the Xtreme, known as the JBL Xtreme 2. The Xtreme 2 has a more upfront mid tone response, while the bass has been compensated with. Thus, instruments and vocals sound a bit clearer on the Xtreme 2, while bass response is better on the original Xtreme. The BoomBox is the Xtreme’s bigger sibling and does a good job justifying its name. It’s a bigger, louder and improved version of the Xtreme in almost every way. Weighing at 5.25 kg, it’s one of the heaviest portable Bluetooth speakers in the market. And the rubberized handle on top makes it somewhat easier to carry around. With two 4 inch woofers, two 20 mm tweeters and two passive radiators, this speaker is built for large rooms and open spaces. The bass gets really deep and punchy, which makes it a great choice for parties. Moreover, the speaker is fully waterproof and floats in the water despite its size, so taking it out by the pool should be no problem. The speaker has the usual set of ports and buttons found in the JBL Xtreme. One difference in the feature sets between the two speakers, is the support for Connect+ in BoomBox, as against the older Connect in the Xtreme. With Connect+, you can connect two speakers in stereo mode or up to 100 compatible speakers in party mode. Another feature which is unique to the BoomBox is the Indoor/Outdoor mode. The indoor mode is much more punchy and deep in the low frequencies, while in Outdoor mode, the mids sound more prominent. Inside the unit, there is a massive battery which lasts for an entire day on a single charge. And thanks to the two USB-A ports at the back of the speaker, you can also charge up to two USB-powered devices at the same time. And with that, we wrap up our list of the best portable Bluetooth speakers available in the market. We hope that this list will help you make a purchase decision, based on the size and sound preference, as well as your budget.